When I first realise that another Halo art book is coming out, I was wondering what they are going to put inside. Turns out this art book is sort of a look back at Halo from the art. 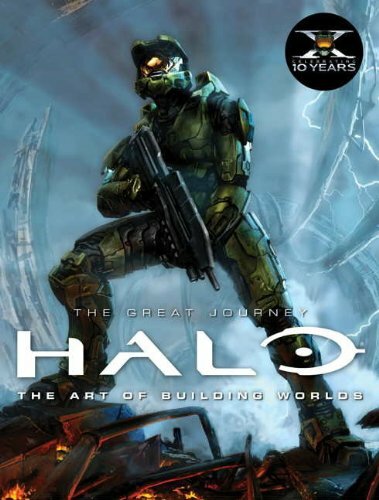 That's looking back at 10 years of Halo, which really needs a few books to be comprehensive. So this book tries to cover in its 192 pages, Halo: Combat Evolved, Halo 2, Halo 3, Halo: ODST, Halo: Wars, Halo: Legends and Halo: Reach. Seven titles if you're counting. The art is grouped in chapters that look at the environment, the enemies, vehicles, alien beings, the good guys, Master Chief and homeworlds. The art is beautiful. There are sketches and also huge paintings. Some are development art, some made it to final. Selected bits are featured so you only get snippets of information, bits and pieces of the whole Halo story. There isn't much duplication compared to other art books because the book shows new art and is made up of stuff that were left out in other books. Because of the immense scope of Halo, this book is a bit underwhelming even though the art is spectacular. Something in my mind keeps telling me there's more. If you've seen Halo Encyclopedia, you know that there's a whole lot more. If you want to check out more Halo art, you can look for The Art of Halo: Creating A Virtual World, The Art of Halo 3 (incredibly rare), Halo: Reach Legendary Edition Guide (art section at the back) and Halo Encyclopedia (the ultimate reference). I'm waiting anxiously for my copy, which should arrive this week! I got The Art of Halo: Creating A Virtual World, The Art of Halo 3(one of the best artbooks I got) and Halo Encyclopedia(terribly disappointing). Man, this review of yours left my mouth watering! THANK YOU! Why didn't you like Halo Encyclopedia? I thought it was pretty good. I agree that the Halo Encyclopedia is disappointing. It's mostly screen captures and models. I prefer the other Halo books because they actually dive into the development art. Side note: Halo Encyclopedia was recently re-released to include Halo Reach specific information. Er...WingsDJY said it all for me, thank you Wings!